It was a fine December day on Leesville Lake in north east Ohio. I was fishing with my old buddy Jim who also happens to be a world class net man. It was 30 degrees, the wind blowing 15 miles per hour and snowing. Our tackle was freezing up after about 5 hours of fishing. We were getting cold and the fish were not in the biting mood so we headed towards the ramp to load the boat on the trailer. Jim was captain that day and as we rounded a point he said, "Look at that!" On the sonar was a huge arc. Jim did a quick loop and idled over top of the fish. I dropped the trolling motor to stay on the fish. The fish were suspended at 5 feet in 16 feet of water. I decided to vertical jig with a #4 Thompson spoon 5 of diamonds in the yellow and red colors. I had to pull the line off of my reel through the frozen guides on my rod to get to the right depth. I only jigged the spoon twice when the rod doubled over and I yelled, "FISH ON!" The beast stripped off line as it headed for the abyss, testing both fisherman and tackle. 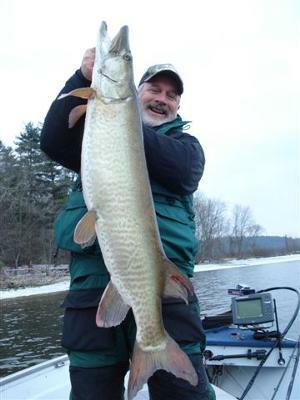 I managed to get the big muskie boatside 3 times before Jim managed to slip the now frozen net under the belly of the beast. It was an epic battle with a great head shake right at the boat. Captain Jim took a few photos, we measured it, got the weight, and the beast was released to fight another day. 49 inches and 37 pounds!